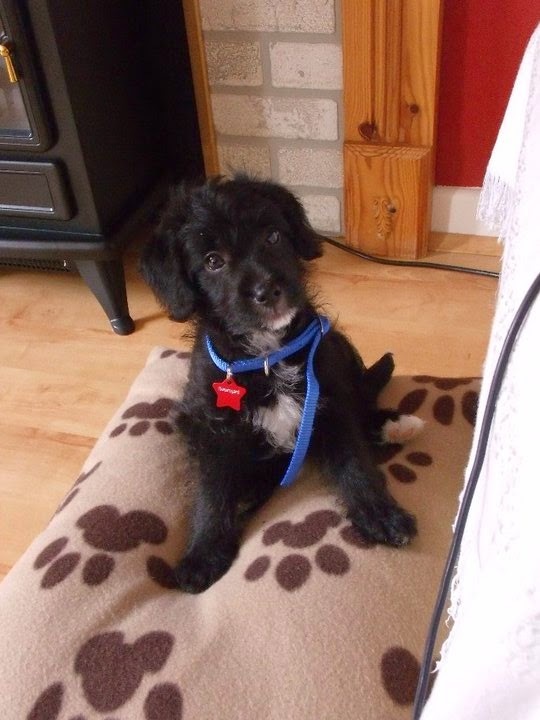 Beauregard, AKA Beau, Beau-dog, Bodelay, Beau Jangles, Bo-face, Poodlehead, LeBeau, Git and Little Sod, is my Jack Russell cross Poodle puppy. He's smart but God he's annoying sometimes! Puppy classes for us! I can't write a longer blog about the ins and outs of a jackapoo because I currently have one sleeping on my feet and I need to somehow remove him so that I can get up to pee. But, I will post a photo. He is insanely cute. Joe doesn't like terriers much, or poodles, and even he was going "aw" at the pics you put on facebook! You're as bad for the nicknames as I am! I wasn't particularly a terrier or poodle person either, but can't resist the cute! His new nickname is Poodleface now. Also just Poodle. And Beaudle.